Hi, I am interested in your 1964 Chevrolet Corvette (stock #4681-ATL) listed on Autotrader for $45,995. I'd like to get more information about this vehicle and confirm its availability. Wearing a sharp looking color and capped with a fresh top above, this 1964 Chevrolet Corvette Convertible represents the model in its outstanding second-generation form and is a solid driver that offers the undeniable appeal of open-air vintage motoring behind the wheel of one of Americas most beloved models. With its exterior outfitted in an appealing shade of red, this Corvette has unquestionable head-turning abilities in its current state - this IS a classic Corvette convertible, after all - though some well-placed attention will bring its curb appeal to a whole new level. A few touch-ups on the fiberglass body and a trip to the paint booth will have this classic back to its former glory. The contrasting black vinyl convertible top was recently installed, so its in fine condition and raises into place without a hitch. The bumpers both fore and aft sit straight and are looking good and the overall body alignment appears to be on point - trace that prominent body contour running most of the perimeter of the car and youll see its nice and level while transitioning from fender to door to rear quarter panel, on back to the taillight area. The window trim is also in solid condition, all badging is present and accounted for and the rocker panels below just need a polishing to bring back their former luster. The black vinyl upholstery has been kept in factory trim, with the pair of distinctive, low-backed buckets showing some wear - they may well be originals, after all - but no serious issues or damages. Climb inside and youll see one of the focal points of Chevys design team at the time - its inspired dash area, with its singular, double cove design housing a comprehensive collection of still-working gauges and an AM/FM/Cassette mounted in a vertical position at the center, just below a sizable analog clock. Just as in the case of the exterior, the surroundings inside are in plenty suitable shape just as is to be enjoyed right away, should you opt to put off any aesthetic re-freshening for the future. The aftermarket air conditioning on board here is about the only deviation from stock and its a welcome one. The feature really comes in handy and in this case the unit has been nicely fitted. Although Vettes had always been designed for haulin, as opposed to hauling, theres some convenient storage space just behind the bucket seats. The 327 cubic inch V8 standing by under the hood is arguably the small block Chevy is best known for and it remains in stock configuration, still wearing a period-correct 4-barrel carb on top as it pairs with a 4-speed manual transmission that puts full control in the hands of the driver - just as it should be in a vintage street machine like this one. You cant help but be impressed at just how dramatically Chevy exceeded the norm, mechanically speaking, as far as how they outfitted their prized model. At the time this 64 rolled out, disc brakes were far from a given on muscle cars even up front, yet it wears them at all four corners, while the independent rear suspension was light years ahead of the leaf spring technology of the era, offering excellent cornering and skip free performance over uneven surfaces. This universally beloved Chevy droptop cruises on a set of 15 stock Corvette wheels that are in nice, clean condition and are wrapped with BF Goodrich T/A radials. Below, the undercarriage looks straight and solid. 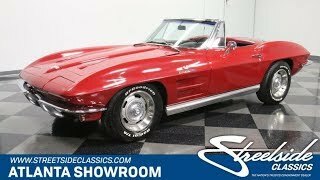 Vettes of this era are getting harder and harder to find - especially those in droptop form and still straight and solid, like this 1964 Chevrolet Corvette Convertible - so its not likely to stay on the lot for long. Call today!